One of my favorite go-to dishes for expected guests is a pretty no fuss puff pastry tart. The toppings are based on whatever fresh produce I have on hand. I buy puff pastry sheets from the grocery store when ever I see them on sale. 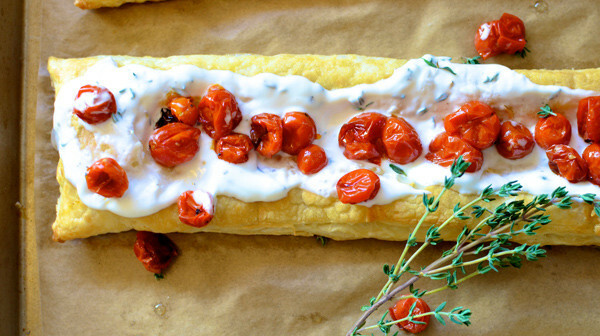 This version has sweet cherry tomatoes paired with a tart & creamy goat cheese spread. One crucial thing I learned from my mother was to always keep certain food items on hand just in case you have unexpected guests. My grandmother’s daily cooking schedule always revolves around the idea that there will be people passing by. Well, living in LA I don’t get as many unexpected visitors as my grandmother does in Kenya, but every so often it happens. Have puff pastry all ready defrosted. Clean your tomatoes & pat dry. The tinier the tomato the better. If they’re too big, cut them in half. Lay tomatoes on a baking sheet. Drizzle with olive oil, and season with kosher salt & fresh cracked black pepper. Roast in the oven until they start to burst and wrinkle. This should take 20-25 minutes. On a fresh baking sheet lined with parchment paper, arrange the puff pastry that has been cut into thirds. Drizzle with olive oil. Spread the oil evenly and arrange a few pieces of thinly sliced garlic cloves. Bake according to the directions on your pastry package. Mine took 15-17 minutes to puff and be golden brown. In a bowl combine goat cheese, yogurt, lemon juice & fresh thyme leaves. Slice into 1 1/2″ wide rectangles & serve. On a fresh baking sheet lined with parchment paper, arrange the puff pastry that has been cut into thirds. Drizzle with olive oil. Spread the oil evenly and arrange garlic cloves. Bake according to the directions on your pastry package. Appropriately 15-20 minutes to puff and be a light golden brown. Divide the goat cheese mixture, and gently spread over each piece of pastry. Top with the tomatoes.